Everyone needs to be as healthy as possible. It’s a no-brainer right! Well it’s especially true for seniors particularly as it relates to influenza, or simply, “flu”. October usually means a change to colder weather in many locations. With the change in temperature, from the warm of summer to the chill of autumn comes the onset of flu season. So just why is it that seniors a re at higher risk during this time of the year? Because their immune system weakens as they age, adults age 65 years and older are more susceptible to the flu. 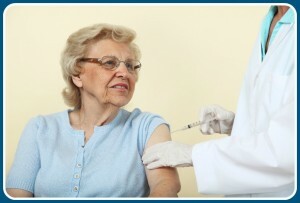 For this reason, it is recommended that all seniors get the flu vaccine. You have two options for vaccination—the regular dose flu shot and the higher-dose flu shot designed specifically for people 65 and older. Both vaccines protect against the same three flu viruses. High-dose, for people 65 and older. This type contains a higher dose vaccine, which may lead to greater protection against the flu. Intradermal, for people 18-64. This type of shot is given with a needle 90% smaller than a regular flu shot and injected in your skin. The higher-dose vaccine should result in a stronger immune response. Talk to your health care provider about which vaccine is right for you. Getting the flu vaccine protects you and prevents you from spreading the flu to your spouse, children, or grandchildren. If you have flu-like symptoms such as those below, contact your health care provider immediately. Antiviral medications are prescription pills, liquids, or inhalers used to prevent or treat flu viruses. They are approved for adults and children one year and older. There are four antiviral drugs approved for treating the flu in the United States—oseltamivir (Tamiflu), zanamivir (Relenza), amantadine (generic), and rimantadine (Flumadine). Wash your hands often with soap and water or an alcohol-based hand rub. Often should be at lease 5-times per day. Avoid touching your eyes, nose, or mouth. Germs spread this way. Practice good health habits. Get plenty of sleep and exercise, manage your stress, drink plenty of fluids, and eat healthy food. If you are sick with flu-like illness, stay home for at least 24 hours after your fever is gone without the use of fever-reducing medicine. Approximately 5% to 20% of U.S. residents get the flu each year. Flu season typically starts in the fall and peaks in January or February or about a 6-month cycle. Because seniors are at an increased risk of getting pneumonia, a complication of the flu, talk to your health care provider about the pneumococcal vaccine. 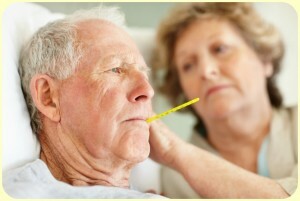 The pneumococcal vaccine protects seniors against pneumonia. I certainly hope this information helps all of us avoid becoming ill with the flu over the next 5-months. Good Luck! As always, education is a key to warding off possible infections. The more we understand how germs are passed along, how best to protect ourselves from those germs, along with some safety tips, we will all have a better handle on controlling the spread of any infections. Infections are caused by the spread of pathogens (germs such as viruses and bacteria) coming in contact with our bodies, either internally or externally. These pathogens are spread by any number of methods: contact with bodily fluids, airborne, skin-to-skin contact, or some contaminated objects or foods. With the “easy-to-spread” assumption of many pathogens, it is prudent that you assume that all situations and all people are possible carriers of a serious pathogen, especially during peak infectious times (i.e., flu season). Although we are certainly not trying to make anyone paranoid, it is important that certain precautions be maintained in the home of a senior care recipient (it should be noted that we are only addressing the “care recipient” environment today, but these same precautions should be implemented in one’s private residence, also). Wash your hands frequently and for a minimum of 15 seconds, especially after using the toilet, handling food, our working with your care recipient. Use gloves in all appropriate situations. Avoid touching your eyes, nose, mouth, etc., especially after working with your care recipient or handling potentially infectious food (i.e., uncooked chicken). Be certain that all food preparation tools and plates are cleaned in soapy water of the correct temperature. Make sure that all work areas are cleaned routinely with disinfectant. Always use lots of water and flush the potentially infected site. Flush the area again, this time using warm water and soap, if appropriate. And if necessary, seek medical advice. Your parents old and worn out phrase, “You can never be too safe,” actually does apply in protecting the work site from the spread of any infectious pathogens. Once you have learned and implemented infection prevention methods, the risks of spreading any pathogen will be greatly reduced. That’s the goal of infection control reduction in the spread of an infectious pathogen. Through this judicious supervision, we should limit the spread of infection, making the home a safe environment for both care recipient and caregiver. Recently I read some striking information from the National Council of Aging (NCOA) regarding the devastating impact that flu has on seniors. I have long regarded “preventative” flu shots as unnecessary. However, as they relate to the well-being of seniors, this article gave me cause for pause. The National Council on Aging announced that it is spearheading a new initiative to help protect older adults from influenza this upcoming flu season. The educational program, Flu + You, in collaboration with Sanofi Pasteur, aims to educate older adults and their caregivers about the seriousness of influenza, the importance of annual influenza immunization, and available vaccine options. Older adults, particularly those over the age of 65, are urged not to wait and to get their annual flu shot as soon as it is available each year. The body’s immune system and its ability to fight illness decrease with age, which means that older adults are more vulnerable to influenza and its related complications. In fact, each year in the United States about nine out of 10 flu-related deaths and more than six out of 10 flu-related hospital stays occur in people over the age of 65. Unfortunately, as we age, the likelihood of developing other chronic medical conditions, such as heart disease, COPD, and diabetes, also increases, and having one or more underlying chronic conditions further increases the risk of influenza-related deaths in older patients. Nationwide, 91% of adults 65 years of age and older have at least one chronic condition and 76% have two or more chronic conditions. The age-related decline in the immune system also affects the body’s response to vaccination. Recent studies have shown that the traditional flu vaccine might not work as well for people 65 years of age and older. As the immune system weakens, fewer antibodies are produced following vaccination to help protect the body against infection. Antibodies are the soldiers of the immune system helping to respond and protect against infection when exposed to the virus. The flu vaccine still offers the best defense to protect against influenza. Adults aged 65 and older have two vaccine options available – the traditional flu shot, as well as a widely available higher dose flu vaccine designed specifically for this population to address the age-related decline of the immune system. The higher dose flu shot triggers the body to produce more antibodies against the flu virus than would be produced by the traditional flu shot. Both the traditional and higher dose flu shot options are among the vaccines recommended by the CDC for adults 65 years of age and older. Medicare Part B covers all influenza vaccine options recommended for this age group with no copay, including the higher dose option. I’m late! To date, only one of my parents, both in their 80’s, have had their flu shot. Last year I recall my mother not feeling very well for almost a week after her flu shot. I’ll speak with her primary care doctor about that during her upcoming appointment. It’s quite likely that he will hold the line and insist that this preventative flu shot is worth a possible of week of not feeling well, when taken into consideration the information in the NCOA article. Thanks again to the National Council on Aging for helping all of us keep on top of critical issues faced by older adults. But, as for me, I’m not getting a flu shot. Maybe in another 5-years, or after a serious bout of the flu, I’ll break down and start taking preventative flu shots. But not just yet!